Snipped this recipe off The Sunday Times a while back and if not for the new crepe pan addition, it would probably have stayed in my recipe book for quite some time before seeing any daylights again. (1) Place the flour, sugar, salt and eggs in a big bowl. (2) Whisk the content in the big bowl while gradually pouring in the milk and water to achieve a smooth batter. (3) Stir in the melted butter until incorporated. (4) Refrigerate the batter for an hour before use. (5) Heat the crepe pan until it is hot. (6) Pour in approximately 70ml of batter (for a 25cm crepe pan), remove the pan off the heat and swirl it around to evenly distribute the batter so that it coats the entire pan. (7) Return the pan to the heat and cook till the edges starts to brown slightly and peel from the side of the pan. 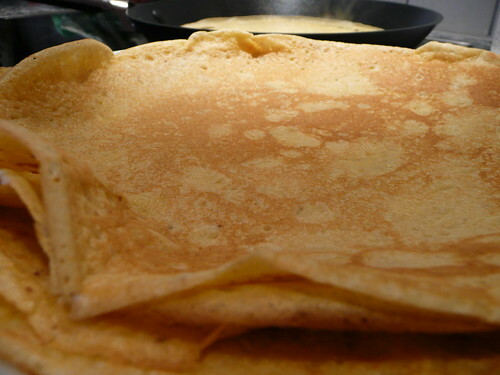 (8) Run a spatula around the edges of the crepe to free it from the pan and when the underside of the crepe has turned a light golden brown, flip it over. (9) Repeat setp (8) for the other side and once cooked, serve it warm with ice-cream or any toppings of your choice! (=) Guaranteed to yield yummy paper-thin crepes!